Ghee (pronounced GEE with a hard G) is the pure butterfat left over after the milk solids and water are removed from butter. It's used widely in cooking Indian foods, and ghee is the Hindi word for fat. Ghee might as well be a synonym for clarified butter, although there is one slight difference. Like clarified butter, ghee is made by melting butter, cooking off the water, and separating the clear golden butterfat from the milk solids. The only difference is that in some traditions, ghee is simmered for a little while, thus browning the milk solids and adding a slightly nutty flavor to the finished product. Not all ghee recipes necessarily specify the browning of the milk solids, however, so for all practical purposes, ghee is clarified butter with an Indian name. Place the butter in a medium-sized saucepan and cook over medium heat. Maintain a gentle simmer on the butter until the middle layer becomes golden and clear. When the ghee is done, skim all of the foam off the top layer and turn off the heat. Carefully pour the golden middle layer through a strainer and into a clean, dry glass jar. Leave the browned milk solids at the bottom of the pan. As the butter melts, it will separate into three distinct layers. At a medium heat, this should take just a few minutes, so keep a careful watch on your butter. The top layer will begin to foam and the milk solids will move to the bottom of the pan. The clarified butter will be in the middle (this is the ghee). Ghee can keep sealed in the jar at room temperature for weeks. Ghee is better for high-heat cooking than butter since it has a smoke point of between 450 F and 475 F, as compared with about 350 F for ordinary butter. Ghee is commonly used in cooking Indian food and can be used whenever butter or oil is used in most recipes. Simply melt ghee and then spread it on bread for a tasty snack or drizzle it over vegetables prior to roasting. Ghee can also be swapped for vegetable oil or coconut oil when making baked goods. 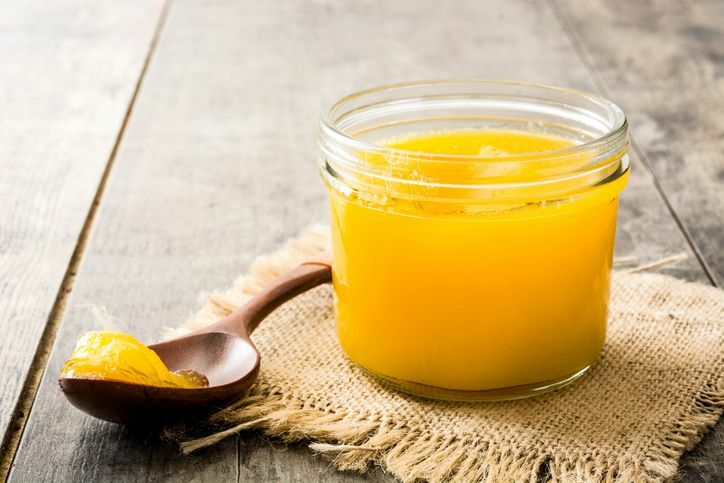 Another advantage of ghee is that it has a longer shelf life than ordinary butter and, when stored in an airtight container, can be kept at room temperature. Ghee can also be kept in the refrigerator or freezer. If storing it this way, ghee will keep for a long time; however, you will need to soften it to use it. Ghee should be kept in a cool, dark, and dry cabinet. Heat and liquid can cause ghee to oxidize or go bad. If oxidation has happened, the ghee will turn an off shade of brown and give off a sour smell. If that happens, the ghee is no longer safe to use and should be discarded.